Revising and developing my notes on the theology of psychology, with particular emphasis on biblical counseling. One important aspect of any psychological system is its anthropology: what is a human being? The answer to that question is a theological question: psychology as a discipline of observation cannot answer that question. Three views have been offered in answer to the question of how exactly man is in God’s image: substantive, functional, and relational. First, the substantive view says that the image of God is inherently structural to man it is a characteristic within the makeup of man…. Second, the functional view asserts at the image of God is something that human beings do…. Third, the relational view claims that relationship is the image of God. The best view however isn’t the image of God is substantive or structural to man. Function and relationship are the consequences of man being the image of God structurally…. The structure probably consist of the complex qualities and attributes of man that making human. This includes his physical and spiritual components. The image could also be linked to personhood and personality and to the powers to relate and operate. MacArthur anr Biblical Doctrine, pp. 412 – 413. Despite the paucity of biblical teaching on the image of God, we may draw five biblical parameters. these guidelines do not answer all the questions we have concerning the image of God, but they give us guidelines by which we may evaluate suggested interpretations of the image of God. Creation in the image of God is affirmed for all persons…. Creation in the image of God involves being like God in some unspecified way…. Creation in the image of God is the basis for human uniqueness and dignity (Gen 9:6; Jas 3:9-10)…. Even after the fall, humans are spoken of as being in the image of God, so the image is not completely lost in the fall. However, it does seem that the image was damaged in the fall, for there are verses that speak of the restoration of the divine image or conformity to the image of Christ as an ongoing process in the Christian life (2 Cor 3:18; Eph. 4:23-24; Col 3:10). Moreover, since Christ is the perfect image of God (Heb 1:3) and the result of this process of restoration is being fully like Christ (Rom 8:29; 1 Cor 15:49; 1 John 3:1-2), we may speak of the image of God as being not only are created design but also our eschatological destiny. In our treatment of the doctrine of the image of God, then, we must highlight, in accordance with Scripture and the Reformed confession, the idea that a human being does not bear or have the image of God but that he or she is the image of God. As a human being a man is the son, the likeness, or offspring of God (Gen. 1:26; 9:6; Luke 3:38; Acts 17:28; 1 Cor. 11:7; James 3:9). On the other hand, it follows from the doctrine of human creation in the image of God that this image extends to the whole person. Nothing in a human being is excluded from the image of God. While all creatures display vestiges of God, only a human being is the image of God. And he is such totally, in soul and body, in all his faculties and powers, in all conditions and relations. Man is the image of God because and insofar as he is truly human, and he is truly and essentially human because, and to the extent that, he is the image of God. Naturally, just as the cosmos is an organism and reveals God’s attributes more clearly in some than in other creatures, so also in man as an organism the image of God comes out more clearly in one part than another, more in the soul than in the body, more in the ethical virtues than in the physical powers. None of this, however, detracts in the least from the truth that the whole person is the image of God. Scripture could not and should not speak of God in a human manner and transfer all human attributes to God, as if God had not first made man totally in his own image. And it is the task of Christian theology to point out this image of God in man’s being in its entirety. Herman Bavinck, John Bolt, and John Vriend, Reformed Dogmatics: God and Creation, vol. 2 (Grand Rapids, MI: Baker Academic, 2004), 554–555. Herman Bavinck, John Bolt, and John Vriend, Reformed Dogmatics: God and Creation, vol. 2 (Grand Rapids, MI: Baker Academic, 2004), 561. Strange, Daniel; Strange, Daniel (2015-02-03). Their Rock Is Not Like Our Rock: A Theology of Religions (p. 92). Zondervan. Kindle Edition. Quoting: Van Til, Introduction to Systematic Theology, p. 45. (By the way, I am finding Dr. Daniel Strange’s book quite useful. So this [a call to worship] is not just a call to do something “religious,” something to be merely added to our “normal” life. It is a call to be(come) human , to take up the vocation of being fully and authentically human, and to be a community and people who image God to the world. This call to worship is an echo of God’s word that called humanity into being (Gen. 1:26–27); the call of God that brought creation into existence is echoed in God’s call to worship that brings together a new creation (2 Cor. 5:17). And our calling as “new creatures” in Christ is a restatement of Adam and Eve’s calling: to be God’s image bearers to and for the world. The “image of God” ( imago Dei ) is not some de facto property of Homo sapiens (whether will or reason or language or what have you); rather, the image of God is a task , a mission. But now proud hearts live not upon the Lord Jesus Christ; they live upon themselves, and upon their own duties, their own righteousness, their own actings, as the Scripture evidences. An humble soul sees that all his stock is in the hands of Christ. His stock of graces, his stock of comforts, his stock of experiences are in the hands of Jesus Christ, who is the great Lord keeper of all a believer’s graces, and of all his comforts; and therefore, as children live upon them in whose hand their stock is, be it a brother or a friend, why, so an humble soul sees its stock is in the hand of the Lord Jesus, and therefore he lives upon Christ, upon his love, and his provision, and his undertakings, &c.
Christ dwells in that heart most eminently that hath emptied itself of itself. Christ is the humble man’s manna, upon which he lives, and by which he thrives, Isa. 58:2, 7; Luke 7:47. Dr. Poythress in his recent book Logic contends that logic’s existence reveals God and exists because of God. He first ties together two proposition: (1) God is Lord over all (Psalm 103:19); and (2) “[L]ogic is not created. Philosophers have maintained that it ‘just is'” (63). 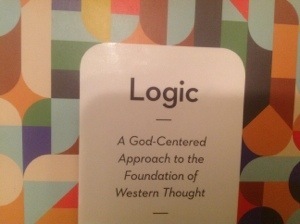 If we try to place God over logic, then logic somehow is a/the Lord of God. Poythress notes three aspects of the character of God. “First, God is dependable and faithful in his character” (63). Thus God by nature holds a logical consistency with whom he is. He is a God who “cannot deny himself” (2 Timothy 2:13). Second, God alone is the Creator — nothing stands above him and nothing stands independently of him. Therefore, his consistency and attributes must be part of who he is: the logical coherence of his being provides the substance of logic. Third, human beings are made in the image of God and think God’s thoughts after God. He quotes Van Til, to the effect that we “think God’s thoughts after Him analogically” (64). Our logic reflects God’s logic. Logic, then, is an aspect of God’s mind. Logic is universal among all human beings in all cultures, because there is one God, and we are all made in the image of God….Whenever we reason, we are imitating God whether we recognize it or not. The only alternative is insanity, which means the disintegration of the image God in us. 64. Thus, human logical enterprises an attempt to describe this aspect of God’s character. Poythress goes on to contend that logic is a personal, not an impersonal, attirbute. He notes that logic is an aspect of human thought — it is not the activity of rocks or trees. Moreover, logic is embedded within language and moves through language. The Bible further teaches that creation itself is the result of rational speech, that is, logical enterprise. Logic, we said, is personal. Now it becomes more evident why it is personal. It not only personal, but a person, namely, the Word of God. But we should be careful to underline the the fact that this person, the second person of the Trinity, is much richer than our human conceptions, either of logic or of reason or of language as a whole. He is infinite, an infinite person, with all the richness of God himself: “for in him [Christ] the whole fullness of deity dwells bodily” (Col. 2:9). Thus logic in a narrow sense is only one aspect of who God is. (71). Calvin claims that the substance of human nature is good. As he states in the Institutes, the original, created human nature is not only good; it is “united to God.” Indeed Adam, is righteous through a “participation in God.” However, in the fall, the accidental characteristic of sinning is added, alienating human beings from God, from neighbor, and ultimately from themselves. In this fallen state, human beings seek their identity “in themselves” or “in the flesh”. They seek to be human apart from God. But this is simply repeating the sin of Adam- following one’s own wisdom rather than lovingly trusting God. While fallen humans share the accidental characteristic of sinning, this characteristic does not completely vanquish the imago Dei, which Calvin says is a “participation in God.” Again, this characterization of the imago Dei makes sense with Calvin’s view of humanity: to be fully human is to be united to God., and although sin seeks autonomy from God, there is still a trace of this union with or participation in God in all humanity. In redemption, then, is where Calvin’s Aristotelian distinctions do especially important work. When Paul speaks about being “crucified with Christ” and putting to death the flesh or the old self, is this misanthropic? Does this make salvation a rupture of identity — leaving behind all that we were and taking only what is new? No, Calvin says. The Christian life, involving the mortification of the flesh, is a restoration of who we were created to be. J. Todd Billings, Union With Christ: Reframing Theology and Ministry for the Church (Grand Rapids: Baker Academic 2011), 44.